Here are photos of the grave of our great-great grandparents Solomon (Shalom-Aharon) and Sophie Tulbowitz, which I took at the Beth Abraham Jacob Cemetery in Albany last month. Solomon Tulbowitz lived from 1845-1918 and Sophie from 1846-1928. We are not yet sure where they were born. According to documents Tanya and I found last month in Rostov, which I will shortly post here as well, which record the birth and circumcision of a son, Gavriel in 1878, and the death of a three and a half year old son Isai in 1879, the couple was described as "meshanene (townspeople) from Rechitsa, a town in southeast Belarus. So given that the bulk of Rostov's Jewish population growth came in the 1860's and 1870's as the trading and manufacturing town on the southern reaches of the Don, just above the Azov and Black seas, making it "the Chicago of Russia", my guess is that the couple was lured there in search of prosperity, which is also why they would be still registered as belonging to Rechitsa. According to Ruby family lore, they ran a tavern there and their oldest daughter Rose (1874-1949)was kidnapped by Cossacks as a small child. The Tulbowitzes could not have been thrilled by an ukaz (degree) by the Czarist government in 1888 that henceforth Rostov (which was formerly part of the Pale and attached to a province centered in Ekaterinaslav (today Dnieperpetrovsk) in Ukraine, would be part of a new Don military province. When the law came down, it looked like the Jews would be forced to leave en masse but by 1891, clearly fearful of destroying Rostov's economic vitality, the regime ruled that all Jews registered as Rostov residents could stay. 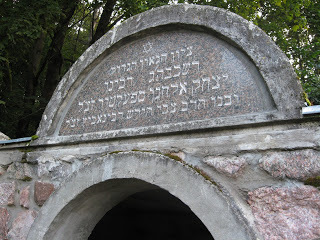 We know that the Tulbowitzes were still registered as being from Rechitsa as of 1879. Were they able to change that in the ensuing decade? If not, their anonamlous status would go a long way to explaining their pull-out from the city to America--first newly married Rose, her husband Abraham Bloch and mother in law Sophie Tulbowitz in 1890 and Solomon and the rest of the family three or four years later. We know they were gone by 1895-96, as no Tulbowitzes show up in the all-Russia census taken in those years. Certainly, given Rose's traumatic experience as a small child, and a small pogrom in 1883, which took place at a tavern when a drunken Russian refused to pay the Jewish owners, they couldnt have been confident that Cossack control of Rostov made the place a safe bet for the long run. The 1900 U.S. census shows Solomon, Sophie and son Edward (born 1876 and probably the twin of Isai) living in Albany near Rose, Abe and their own growing family, with Solomon and Edward working as tailors. Did all the rest of their children die in childhood? What about Gavriel? We know from Sandy Brenner, who heard from her mother Lillian Ratner Klein, that matriarch Sophie in her later years was known as the "scoial worker" because she was concerned about everyone's welfare and got involved in trying to solve the problems of others. Thats not a lot, but its something and we;ll keep digging. Love to you, Shalom-Aharon and Sophie Tulbowitz, from across the centuries. As you all know by now, I got mugged and had my camera grabbed in Kaunas while visiting sites connected with the life of Rabbi Spektor. While the culprit was caught and the camera returned, the memory chip was lost so all precious photos from Ukraine, Rostov, Moscow and Belarus were lost as well. 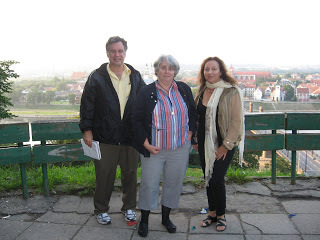 Fortunately, my wonderful guides in Kaunas and Vilnius, Asia Gutterman and Regina Kopilevich lend me cameras so I was able to bring home some meaningful photos from those places. Here are a few of them. 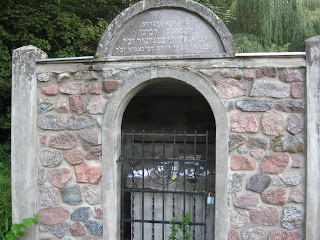 picture 1--the ohel (masoleum)dedicated to Rabbi Isaac Elchanan Spektor and his sopn Rabbi Tzvi Hirsh Rabinowitz at the new Jewish cemetery in Kaunas. 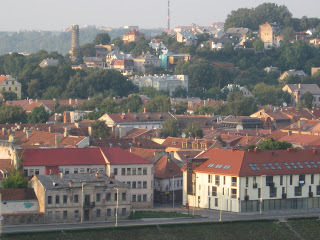 images of Kaunas, grim and lovely--life is complicated, eh? 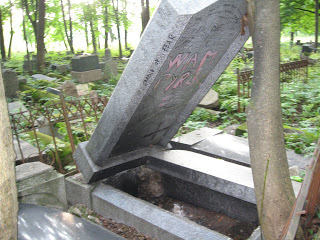 picture 1--grave pried open by robbers looking for gold in the old (and practically abandoned)Green Hills Jewish cemetery in Kaunas. Shmuel Elchanan found and repaired here the graves of Rabbi Spektor's wife Sarah Raizel and his youngest son Binyamin Rabinowitz. 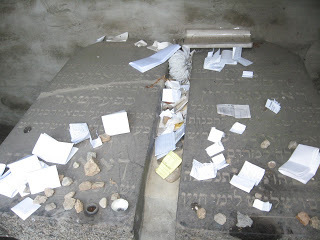 It is almost certain that the grave of Chaim Rabinowitz, the rabbi's oldest son our great-great grandfather and his daughter Rachel are here in this neglected and much vandalized cemetery as well, but we were unable to find them. The masoleum of Rabbi Spektor and Tzvi Hirsch Rabbinowitz was originally here but destroyed in the early 1980's when the Soviet authorities decided to level the cemetery for new development (that never happened but many graves were destroyed). Their bodies were dug up and moved to the new Jewish cemetery. 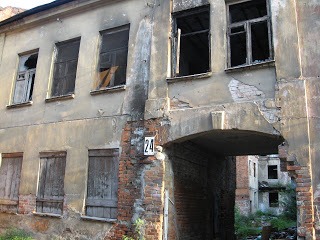 The ruined house in the center of Kaunas where Rabbi Spektor once lived. His youngest son, Binyamin Rabinowitz lived here until 1906, when he was murdered by the husband of the family's washerwoman. Shmuel Elchanan lived here with his family as a youth until they were arrested by the Nazis in 1941 and taken to concentration camps. 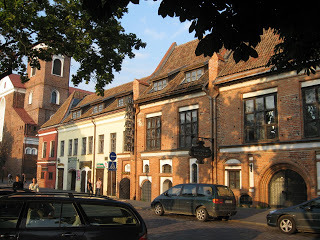 picute 3--an upscale street scene in downtown Kaunas only a few blocks from Rabbi Spektor's ruined house. 1. 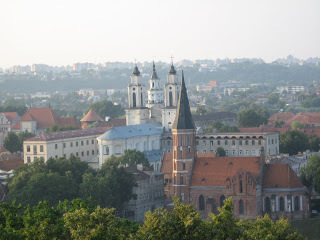 The Vilnius Cathedral--originally a pagan temple stood here, as Lithuania didnt become Christianized until 1381, the last pagan country in Europe. Its pretty Catholic these days. 2. The new, playful post-Soviet Lithuania. Those workers are really dummies, not people. 3. Our guide, Regina Kopilevich, in front of the door of Vilnius University, which dates back to 16th Century. 5. Walter and Tanya with a statue of C. Szabard, a Vilna Jew who was the prototype for Dr. Ibalit, upon whom Dr. Doolite was based.